I know a recipe is good if I’m still thinking about it three weeks later. Yesterday I picked up six ears of corn at the Tower Grove Farmer’s Market because I needed to make this again. Sweet corn kernels, limas, garbanzos, tomatoes tossed with tarragon and a champagne vinaigrette. It’s so amazingly addictive. Hands down, this is my favorite find this summer. I adapted this from a recipe on the Williams-Sonoma website. There is a lot of wiggle room here — grill the corn, or boil it. Use other varieties of beans, such as fava, or use different herbs. But please, do include tarragon. The hint of licorice and the sweet tang of the vinaigrette is what really make this work. I took some of this over to my friend Christine, who had twin boys five months ago. Yes, it’s taken me five months to take food to her. I also took her my mom’s chicken tetrazzini — 80’s comfort food at its best. Better late than never, right? And few things are better than summer veggies in late July. 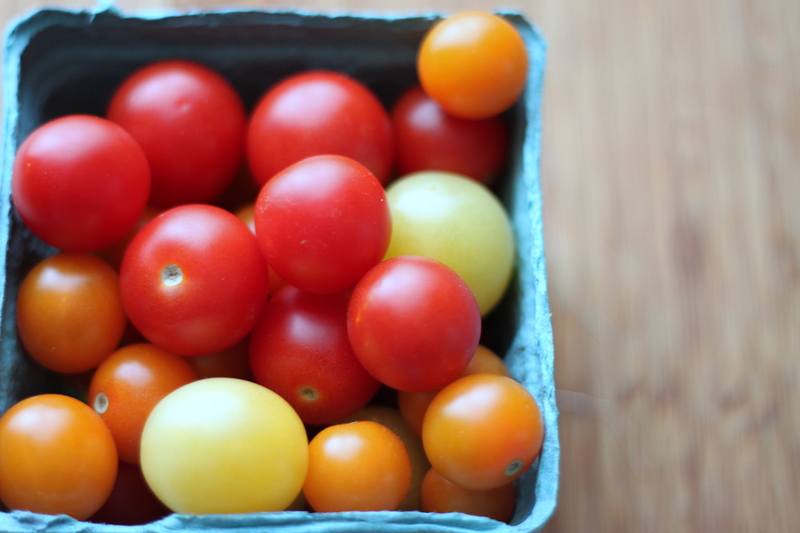 Sweet corn, multi-colored tomatoes, fragrant herbs. Before I turn you loose with this recipe, know that this may take longer to make than you’d expect. Plan for 45 minutes if you use corn on the cob. The only problem here is you’ll end up with more vinaigrette than you’ll need. This is best at room temperature. 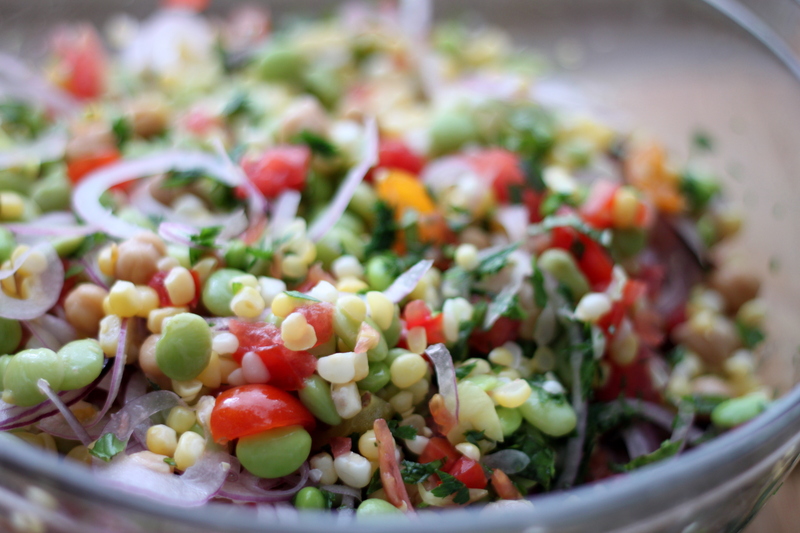 I can say with near certainty that it’s nothing like the succotash you grew up with. To make the vinaigrette, in a bowl, combine the grapeseed oil and olive oil in a measuring cup with a spout. In a nonaluminum bowl, whisk together the vinegar, mustard, shallot, salt and white pepper. Add the oils in a slow, steady stream, whisking constantly. Use immediately, or cover tightly and refrigerate for up to 2 days. Bring a pot three-fourths full of salted water to a boil over high heat. Boil corn for 10 minutes. Rinse under cold water. 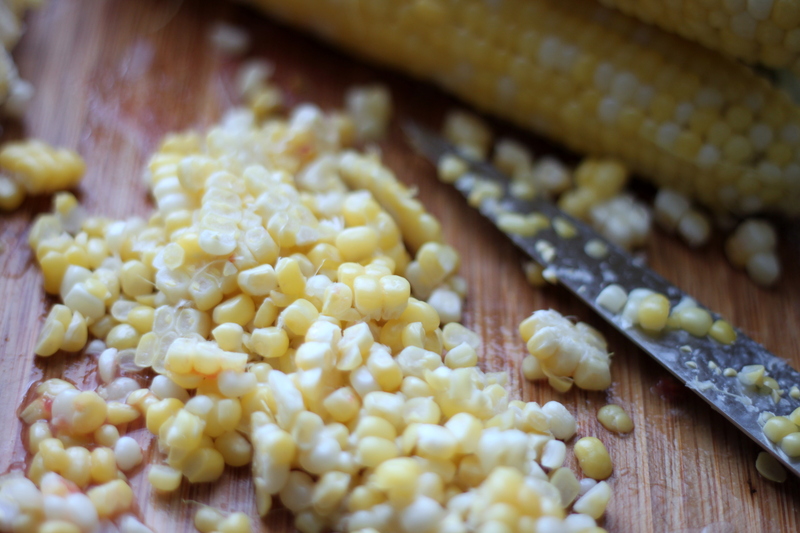 Remove kernels with a paring knife, running the knife down the cob vertically. Put corn in a large bowl. Boil edamame and lima beans according to package instructions. In a large bowl, combine the corn kernels, chickpeas, lima beans, vine-ripened and teardrop tomatoes, basil, parsley, tarragon and onion. Drizzle with 1/2 cup of the vinaigrette and toss gently to coat. Season with salt and black pepper. Serve with the remaining vinaigrette on the side. Serves 6 to 8. Complain about the weather and watch me roll my eyes. But this summer, I get it. I am complaining, too. It’s been a million degrees every day this past month in St. Louis. When the sun isn’t blazing, rain is pouring. And before it got hot, we had tornadoes every other week. Yes, I am tired of it. How hot was it this week? I’ll spare you the triple-digit heat index. It was so hot that a colleague of mine baked two dozen cookies in her car outside the paper. It was so hot that the Tower Grove Farmer’s Market was packed before 8:30 a.m. It was so hot that Gabi hasn’t gotten to splash around in her wading pool since the beginning of July. When it’s 100-plus degrees, it’s almost too hot for ice cream. Sorbet or granita is better. Both are lighter, cleaner, stronger. 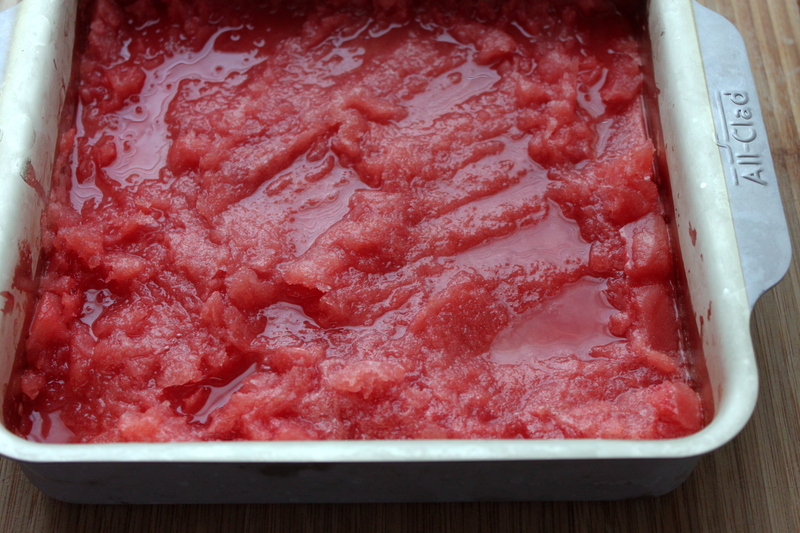 This weekend, watermelon granita fit the bill. Granita is an Italian semi-frozen dessert made from water, sugar, and fruit. First you make a simple syrup. Then puree the fruit in a blender. Combine the two in a metal baking dish, freeze, stir with a fork after a few hours and sha-bam. You have granita. If you need to, put it on the counter for a few minutes to thaw a bit before serving. I love this recipe. 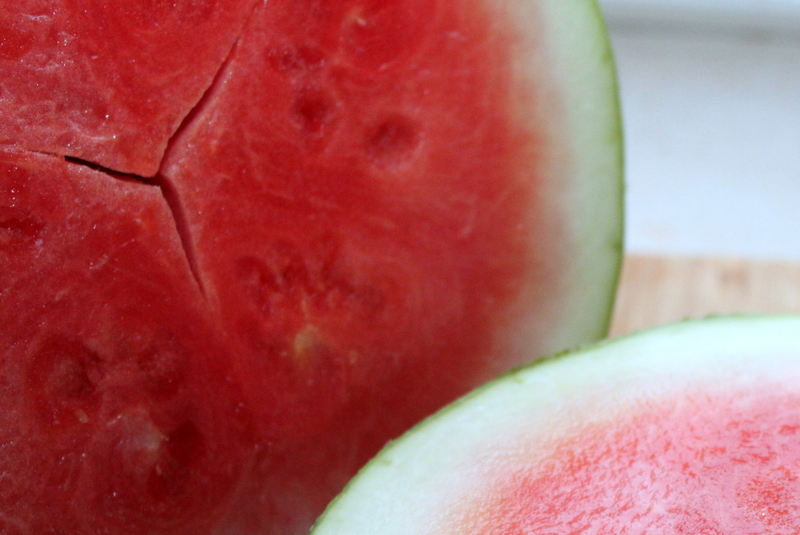 If you love watermelon like my toddler and I do, then you will too. 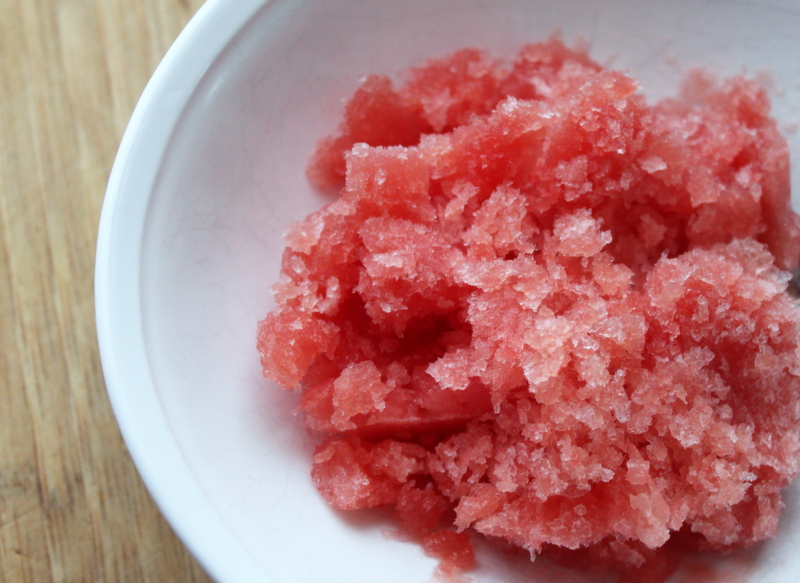 For extra indulgence, drizzle a half-teaspoon of Campari over your bowl of granita. The result is an adult icee that will make you feel better about the heat. Heat sugar and water in a heavy small saucepan over low heat, stirring until sugar dissolves. Turn up the heat and bring to a boil. Cool. Puree the watermelon in a blender. Measure out two cups of puree. Stir in sugar syrups and lime juice. Pour into 8x8x2-inch metal baking pan. Freeze 2 hours. Stir with a fork, then freeze until solid, about 3 hours. Using for, scrape granita to form crystals. Spoon into bowls. Drizzle 1/4 to 1/2 teaspoon Campari over each. This past weekend, Jeff got up at 6:30 a.m. and began the 14-hour task of smoking a brisket. It was an 8-pounder — a week’s worth of sandwiches. As wonderful as the tender brisket was (we could pull it apart with forks), four days later we have become brisket-ed out. Too much meat, I must say. But the beans I could eat forever. These were my contribution to the meal, plus homemade white bread. 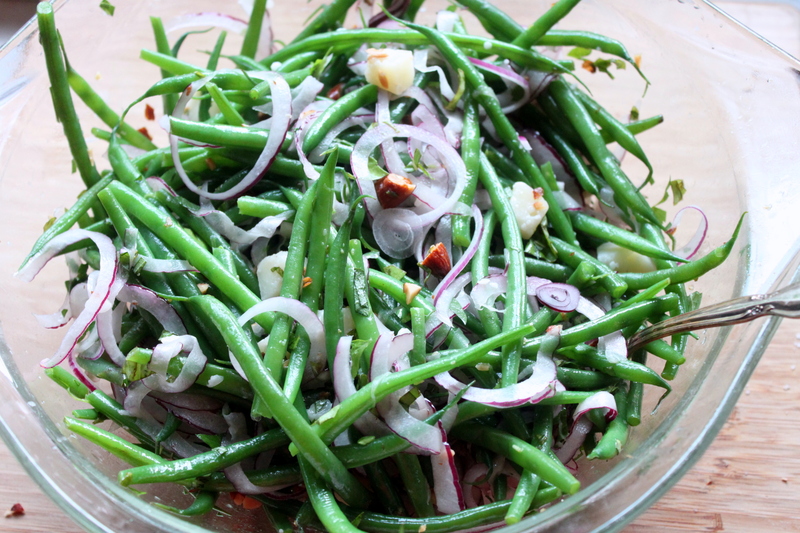 Honestly, It’s hard to find a green beans worth blogging about. I typically fall back on sauteing them with shallots and slivered almonds. This Spanish combination of red onion, fried almonds, herbs and Iberico cheese is a different twist and one that must replace the shallots-and-almonds stand by. 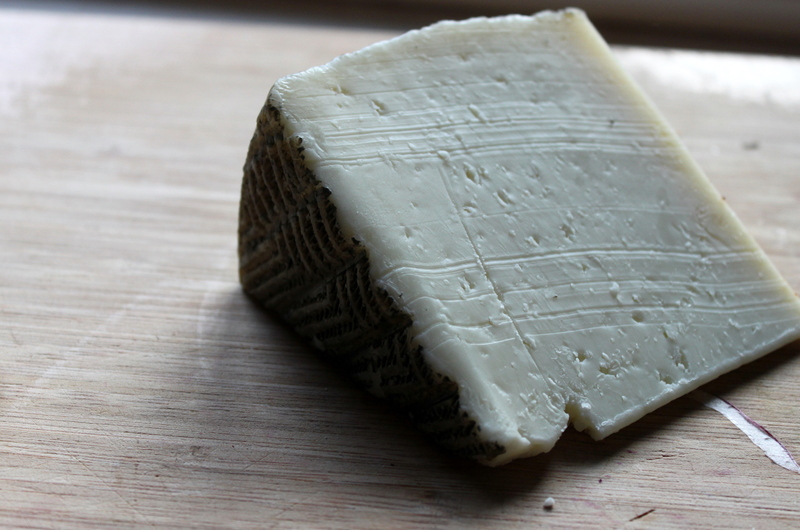 Manchego or Parmigiano-Reggiano cheeses work well here, too. Slicing the onion as thin as humanly possible is key here. If you have a mandolin, use it. Or, consider buying an inexpensive hand-held one. These beans were toddler approved. We adults loved them too. Heat 2 tablespoons oil in a small skillet over medium high heat. Add almonds and cook, shaking skillet back and forth every now and then until nuts are golden and start to pop, about 4 minutes. Remove from heat, sprinkle with 1/2 teaspoon salt, and stir. Remove nuts from oil with a slotted spoon and drain on paper towels. 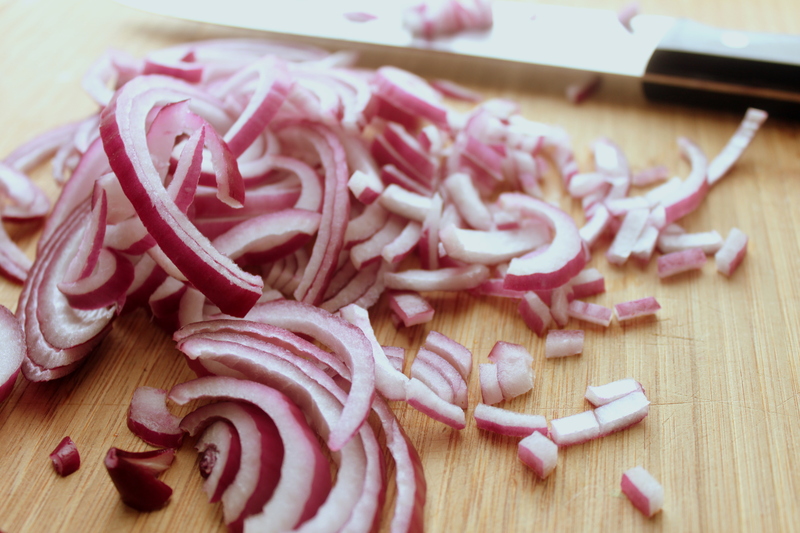 Then coarsely chop. Bring a large saucepan of well-salted water to a boil. Add beans and cook until crisp-tender, about 5 minutes. Drain, transfer to a large bowl, and immediately toss beans with remaining 1/4 cup oil and 1/2 teaspoon of salt. Add cheese, onion and herbs. Toss well. Let sit for a few minutes, then toss with almonds and serve. One of the most frustrating things about keeping a food blog is photographing everything (or most things) that you cook. No matter how many shots I took of this AMAZING bahn mi, the pics just are not pretty. The contents spill out in an awkward way. The plate is messy. It won’t win any beauty contests, but it’s insanely good. 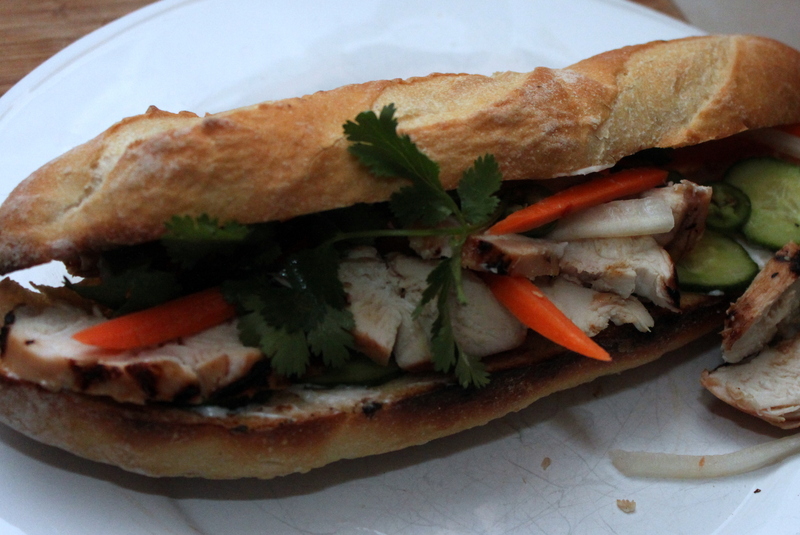 A bahn mi is a Vietnamese sandwich that combines hot, sour, sweet and crunchy. It is a little like a salad between two pieces of toasted French bread. I won’t kid you. Making one can be time consuming. 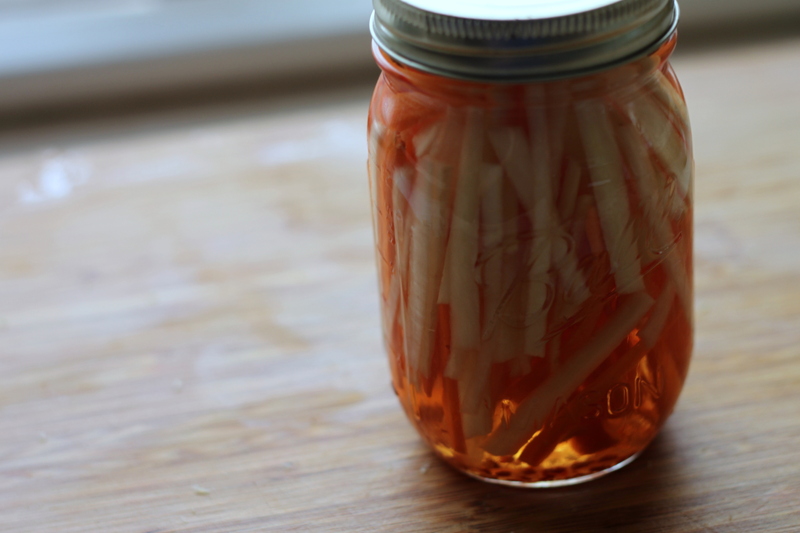 It involves pickling carrots and daikon radish. Then you must marinate, chop, grill and assemble. And finally, it’s time to take a bite. The combination of flavors and textures is incredible. Jeff and I have been doing a lot of Vietnamese cooking this summer. Lime juice, cilantro, fish sauce and chiles have a cooling effect when its 90-degrees outside, and we’ve had too many of those so far this year. 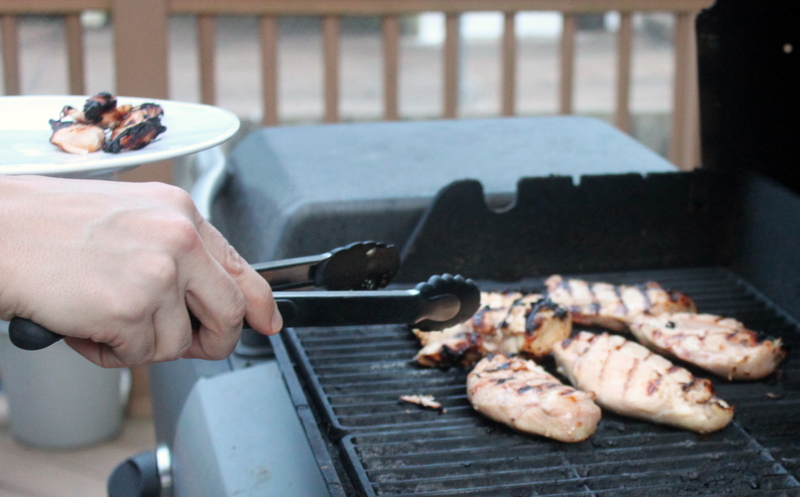 The marinade , which combines hot, salty, sour and sweet, makes killer chicken. Keep in mind that it has lime juice, so don’t let the chicken soak longer than three hours. Citrus can do funky things to protein if given more time. I’m also including rough instructions for a Vietnamese chicken salad, which can be assembled in 15 minutes with leftover grilled chicken and the pickled veggies. No cooking required. I’ve become a slacker lately when it comes to weeknight meals. I could spend the next few sentences explaining why — valid excuses, considering how much I’ve been working lately — but really it’s because of this: I’m tired!!! And when I’m tired, we eat leftovers all week! You can relate? You know how it feels to spend days eating jarred pasta sauce and frozen meals? Last week, this recipe got us out of the weeknight rut. I found it in Bon Appetit’s Fast Easy Fresh Cookbook– a tome filled with simple and fresh meals. Many of them are so simple they feel like cheating. This salmon takes less time than boiling water. I made it twice, after working 10 hour- plus days. I came home exhausted and in need of something healthy. There’s a fair degree of heat to this dish because of the red curry paste. The paste is a Thai staple made from a concentration dried red chile, garlic, shallot, lemongrass and a few other spices. Like soy sauce, there are winners and losers when it comes to the packaged stuff. If you have an international market near you, look for Mae Ploy. Otherwise, use what’s available. Once you whisk the curry paste with lime juice and vegetable oil, you coat the salmon with the mixture. Then toss green beans and slices of red bell pepper with a bit of oil and salt. 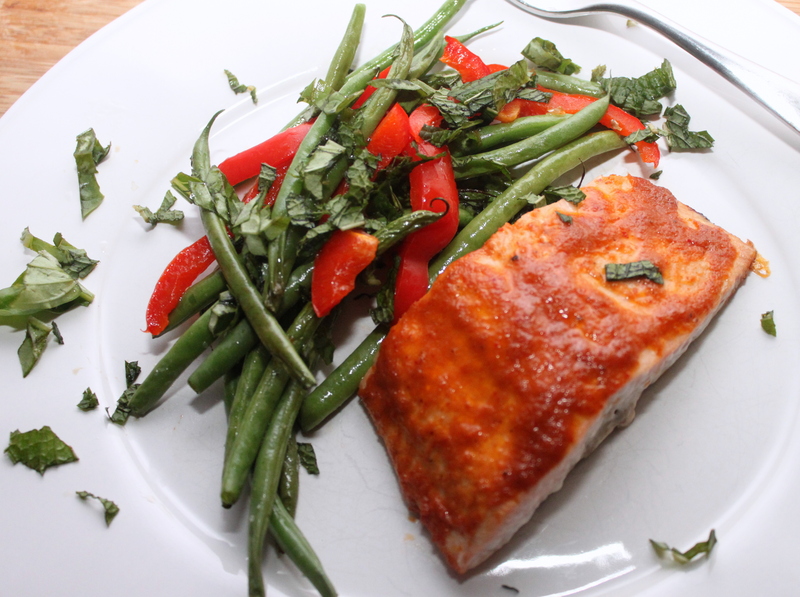 Place the salmon and veggies on the same sheet pan and roast for 12 minutes. Sprinkle with chopped basil and mint. That’s it. It couldn’t be easier. Is this dinner party quality? I say no, but you be the judge. On a weeknight, it’s fast, easy and healthy. And it certainly is better than jarred pasta sauce. Preheat oven to 400°F. Spay a heavy rimmed baking sheet with nonstick spray, or lightly grease with vegetable oil. Place fish on half of prepared baking sheet. Whisk 1 tablespoon of the oil, lime juice, and curry paste in a small bowl. Spread the mixture over the salmon. Toss green beans and bell pepper in a medium bowl with remaining 1 teaspoon oil. Arrange green beans and pepper on other half of the baking sheet. Sprinkle with salt. Roast in oven until fish is just opaque in center and veggies are crisp tender, about 12 minutes. Put fish on plates and veggies next to the salmon. Sprinkle mint and basil on top. Serve with lime wedges. I’ve told myself that I will be a good fantasy baseball wife this year. I won’t complain when Jeff disappears to check stats online, or when he needs flip channels to check scores. He knows full well that I’m not that into baseball, or sports in general. And in the past, I haven’t been as supportive as I could when it comes to his favorite hobby. But this year is different, I’ve told myself. The other day we drove six hours to Little Rock so he could draft his team for a league he’s been part of for 10 years. We saw old friends and visited favorite haunts (we met while working at the newspaper, the Arkansas Democrat-Gazette). The next morning, Jeff took his laptop to the breakfast room of the hotel and spent another couple of hours drafting yet another team for a different league. No eye rolls or complaints from me. When we returned, I decided to give in to my craving for something warm, spicy and hearty. I love Indian food like Jeff loves baseball. I’m pretty sure it’s the cumin. Whatever it is, I can’t get enough. So, on Monday, I spent about an hour making these lentils. 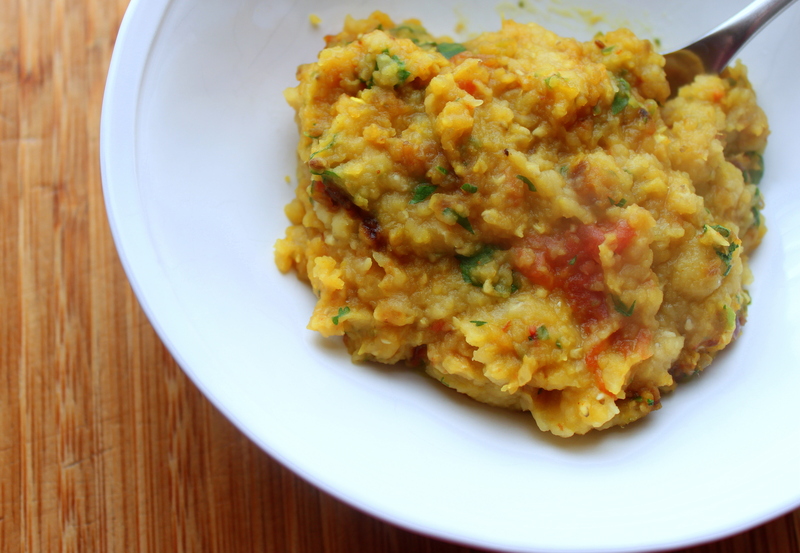 Of the dozens of dals I’ve tried over the years, only a few have made it to GarlicShoots. This one is most definitely blog worthy. In a few days you’ll see butter chicken, which accompanied these lentils and rivals my friend Aisha’s. Gabi was gobbling it up. We all loved it. I will make it again this weekend. 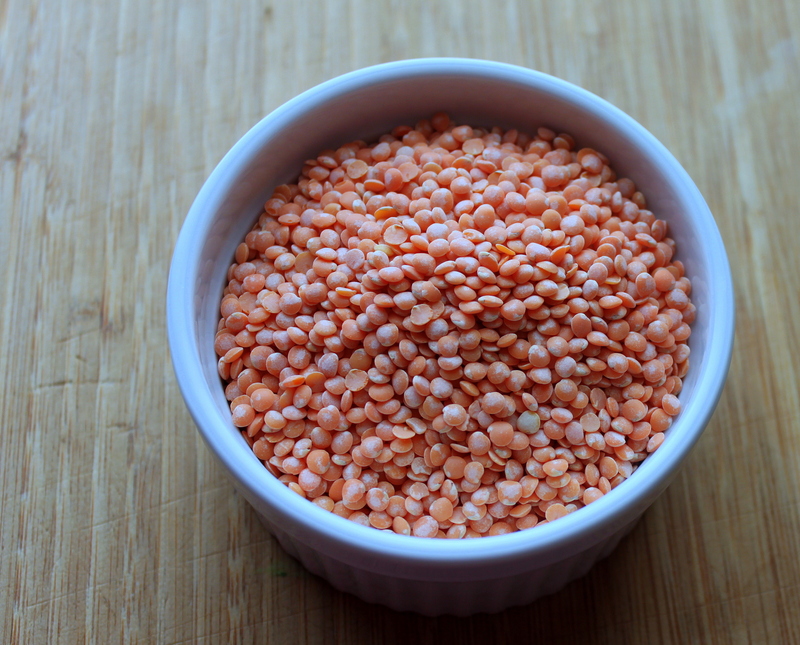 Rinse the lentils by placing them in a medium saucepan and covering with water. Rub them between your fingertips. Drain the water and repeat a few times until the water remains somewhat clear. Drain. Add 3 1/4 cups water and bring to a boil, uncovered, over medium heat. Skim off and discard any foam on the surface. Reduce heat to medium low, cover, and simmer, stirring every now and then, until the lentils are tender, 18 to 20 minutes. While the lentils are cooking, combine the onion, garlic, ginger and fresh chiles in a food processor. Pulse, mincing the ingredients. Do not let blades run constantly or the mixture will become watery. Heat the oil in a small skillet over medium-high heat. Cook the cumin seeds, dried chiles for 5 to 10 seconds, until the chiles blacken and the seeds turn reddish brown and smell nutty. 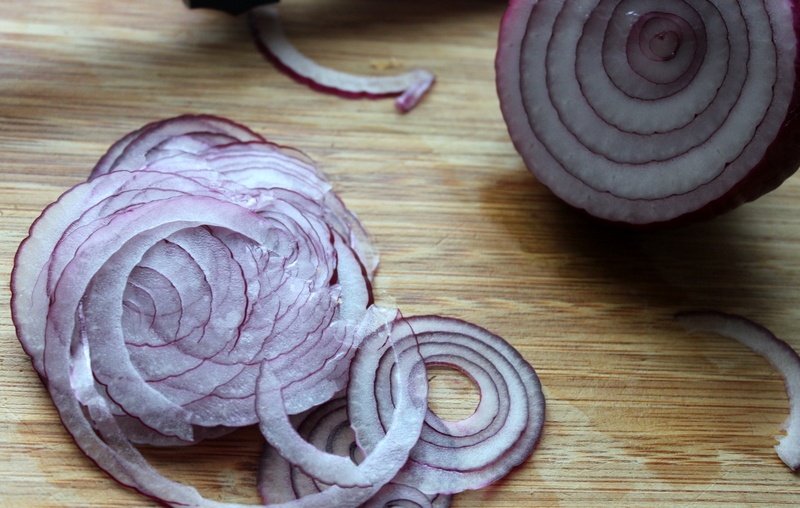 Immediately add the onion blend, reduce heat to medium, and fry until the mix is light brown around the edges, stirring constantly, about 3 to 5 minutes. Stir in the tomato, salt and tumeric. Simmer, uncovered, stirring occasionally, until the tomato softens, 3 to 6 minutes. Stir in the cilantro. Stir the sauce into the cooked lentils. Cover the pan and simmer over medium-heat, stirring a few times, until the flavors blend, about 5 minutes. Serve warm. I intended to make a kale caesar. My friends Nancy and Jeremy raved about one they made last month — a true caesar salad, with a creamy dressing from egg yolks and anchovies. It sounded interesting. I picked up the ingredients. I started to measure. Then I looked at my mortar and pestle and thought about how much I didn’t want to use it to pound the anchovies into a paste. Yes, I chickened out. I made this kale salad instead. Why kale? The past two weekends of decent temperatures have made me crave green. Spring is flirting with us here in St. Louis. Crocuses are blooming in our front yard, and a couple of days last week were warm enough to shed coats. But then, sadly, spring scampered off today and the cold returned. It’s gray, gray, gray. And I want green — green leaves, green grass, and green food. I used to shy from raw kale. Then last summer, I had a phenomenal salad of kale and red cabbage while passing through Boulder, Colorado. I still think about it. 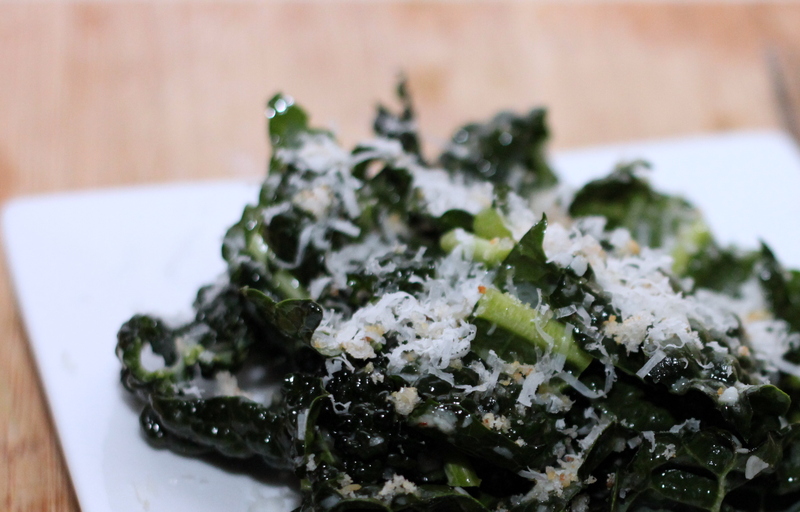 For best results, use Tuscan/lacinato kale if you make this. It’s also called dinosaur or black kale. The leaves are more tender. This is a strong-tasting salad, as you’d expect from raw kale. The lemon, garlic and Pecorino offset the bitterness of the leaves. 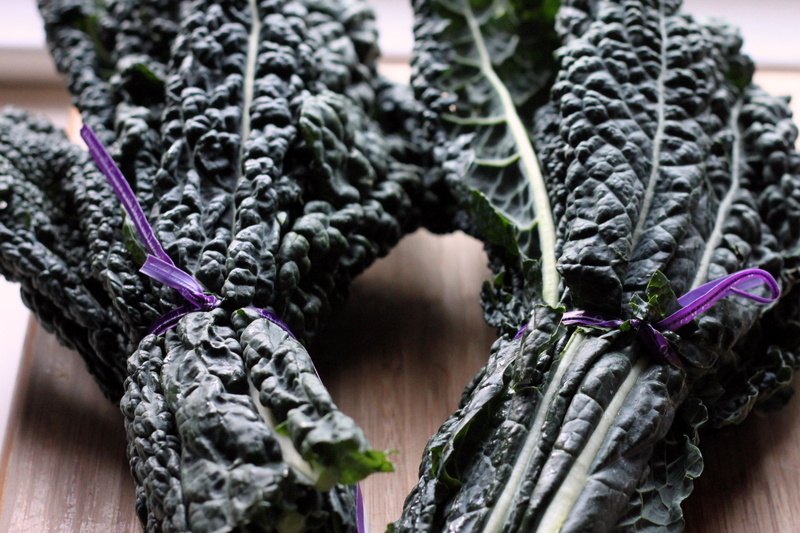 It’s incredibly nutritious — exactly what we all need after months of gray weather. The beauty of this salad is that it won’t wilt. Dress it, put it in the fridge and it’s just as good the next day. 1. Wash the kale. Trim bottom 2 inches of the stems and throw them out. Slice kale, including ribs, into 3/4-inch-wide ribbons. You should have 4 to 5 cups. Place the kale in a large bowl. 2. If making homemade bread crumbs, toast a slice of bread until golden on both sides. Tear it into small pieces and grind in a food processor until mixture forms coarse crumbs. If using croutons, grind in a food pro until crumbs are coarse. 3. Pound garlic into a paste using a mortar and pestle. Transfer garlic to a small bowl. Add 1/4 cup cheese, 3 tablespoons oil, lemon juice, salt, pepper flakes and black pepper, and whisk to combine. Pour dressing over kale and toss very well to combine (dressing will be thick and need lots of tossing to coat leaves). 4. Let salad sit for 5 minutes, then serve topped with bread crumbs, additional cheese and a drizzle of oil.